The Rice Diet was created by Walter Kempner when he was a member of Duke University's Department of Medicine. The diet is the result of Kempner's work and research about high blood pressure and diabetes, and it is a low-fat, low-calorie way to lose weight and improve health. The diet is based on the notion that using rice as a staple food rarely causes health problems. Always speak to doctor before starting a weight-loss program, however, to be sure it's right for you. Follow the basic Rice Diet on the first day of Phase One. Eat two starches, such as rice or potatoes, and two fruits for each of your three meals. Eat following a lacto-vegetarian rice diet for the next six days. This means that you'll eat one starch, one serving of nonfat dairy and one fruit for breakfast. You'll eat three starches, three vegetables and one fruit for both lunch and dinner. Do not add salt to your food. During Phase One, keep your sodium intake between 300 and 500 milligrams per day. Adhere to the serving sizes closely. One starch is the same as one slice of bread, 1/2 cup of pasta or 1/3 cup of rice or beans. One fruit is equal to a whole piece of fruit, such as an apple or orange, half a banana or 1 cup of chopped fruit. A cup of raw vegetables or 1/2 cup of cooked vegetables is equal to one serving, and 1 cup of milk or yogurt or 1/2 cup of cottage cheese is equal to one serving of dairy. Follow the basic Rice Diet on the first day of Phase Two. This is the same diet as the first day of Phase One. Eat two starches, such as rice or potatoes, and two fruits for each of your three meals. Eat a lacto-vegetarian diet for the next five days. Have one starch, one dairy and one fruit for breakfast and have three starches, three vegetables and one fruit for lunch and dinner. Acceptable foods during these five days include fruits, vegetables, grains, whole-grain cereal and bread and nonfat dairy foods, such as milk and yogurt. Add three servings protein to your diet on the seventh day of Phase Two. Choose a serving of fish, eggs or, if you're allergic to either of these, another type of lean meat. Substitute two additional servings of dairy for the three servings of protein if you'd rather. Limit your intake of sodium to between 300 and 500 milligrams per day. Repeat Steps 1 through 4 until you've reached your weight-loss goals. Follow the basic Rice Diet on the first day of Phase Three that you followed on the first days of Phase One and Phase Two. Eat two starches, such as rice or potatoes, and two fruits for each of your three meals. Eat a lacto-vegetarian rice diet for the next four days. Eat one starch, one nonfat dairy and one fruit for breakfast. Eat three starches, three vegetables and one fruit for lunch and dinner. Follow a vegetarian "plus" diet for the next two days. Eat two starches and one fruit for breakfast and have three starches, three vegetables and one fruit for lunch. For dinner, eat three starches, three proteins, such as beans, fish or eggs, three vegetables and one fruit. You can substitute two dairy foods for the three protein servings, as well. Limit your intake of sodium to between 500 and 1,000 milligrams per day. Be a mindful eater, Kitty Gurkin Rosati and Robert Rosati recommend in their book "The Rice Diet Solution." When you understand and pay attention to what you're putting in your body, you're more likely to make lasting dietary changes that will help you keep the weight off. Get enough rest. Set aside time each day to simply rest your body and think. The Rosatis note that this time can help you set goals and determine ways to achieve them, things that aren't possible if you never slow down enough to really think about why you want to lose weight. Get plenty of exercise. In addition to dietary changes, adequate amounts of exercise reduce your risk of certain health problems, such as heart disease, and will help maximize your calorie burn so you're able to shed excess pounds. Find support to help motivate and encourage you as you make these dietary and lifestyle changes. Perhaps a spouse could do the diet with you, or you could ask a friend to embark on the program with you. 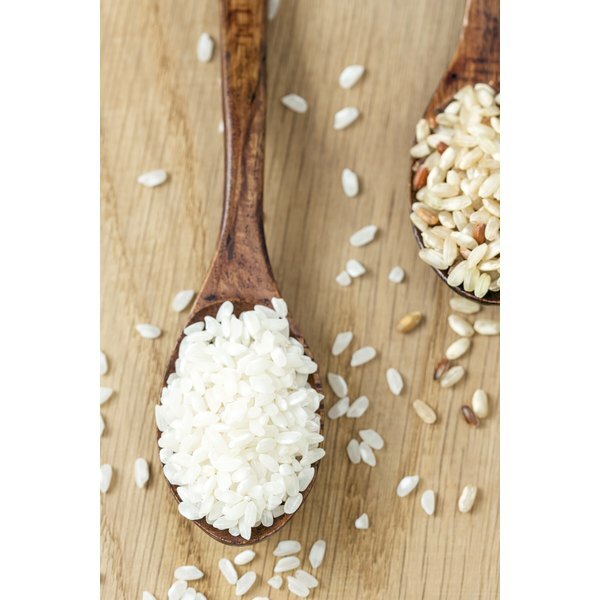 The low-sodium and low-fat nature of the Rice Diet will help lower your risk of high cholesterol, high blood pressure, heart disease and diabetes. Talk to your doctor before starting the Rice Diet. It can be challenging to cut calories, fat and sodium from your diet at one time. You might feel deprived or hungry during the first days of the diet.